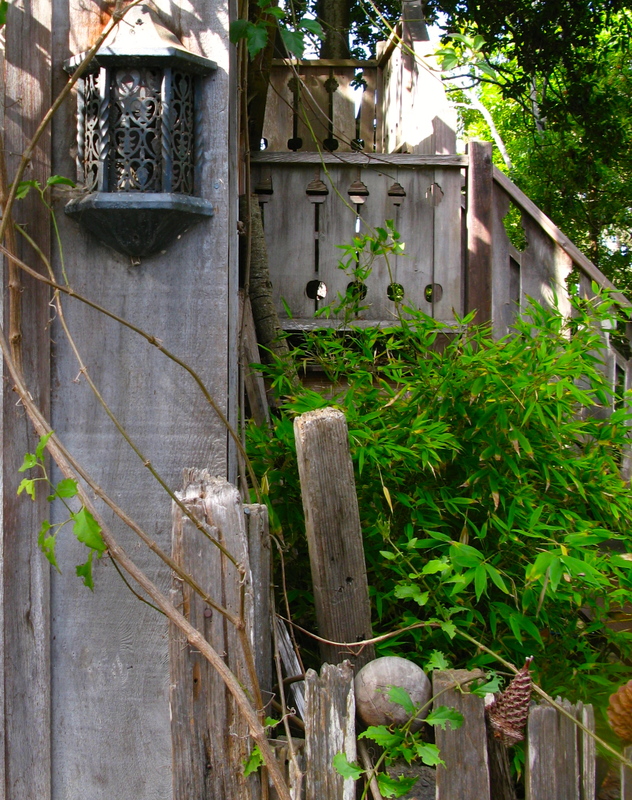 Hidden behind an ivy covered fence, sits The Cottage. I would never have found this tiny spot included in Carmel’s Register of Historic Resources, were it not for the help of Jayne Bechtel. Jayne is a talented artist I meet while blogging. 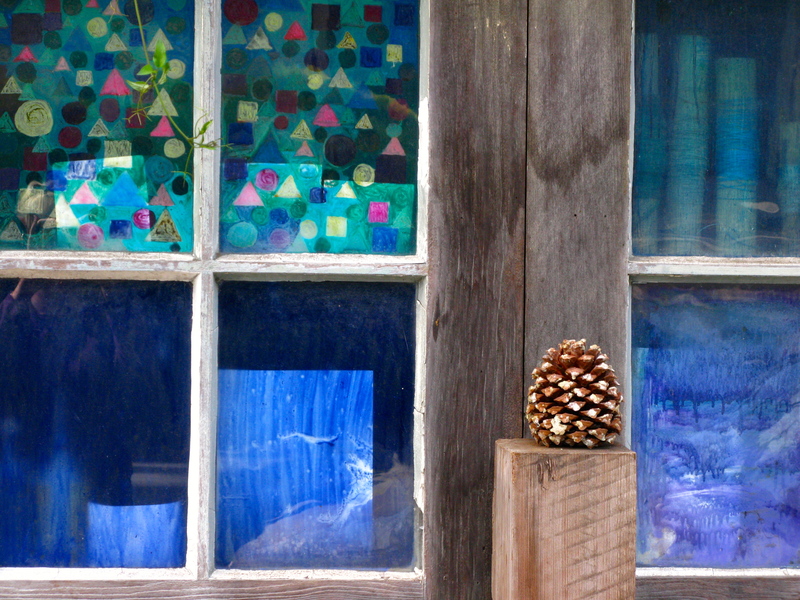 We first meet on-line and discover that she has painted many of the homes I have photographed. 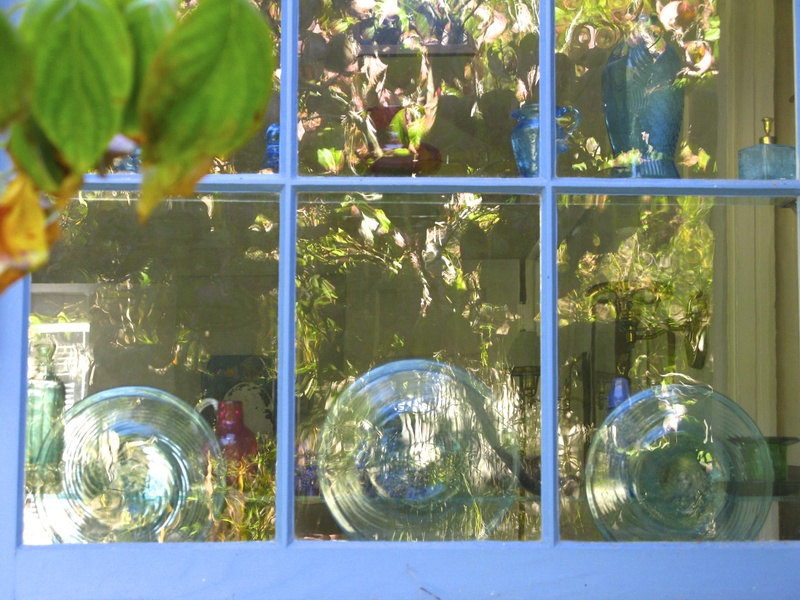 I buy one of her works for our Carmel home and in passing she mentions several home owners she thinks might be willing to share their homes and gardens. And so it is, that I find myself entering this gate. I catch my first glimpse of a home built by Dr. Amelia Gates. 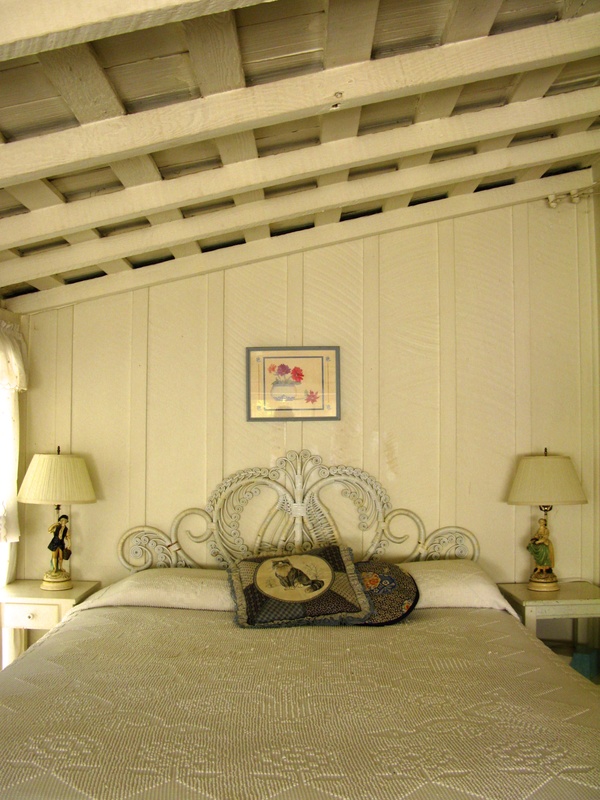 This one-story, redwood board-and-batten cottage sits well back on its lot behind a carriage house. I admire the informal garden setting of mature trees and shrubs. 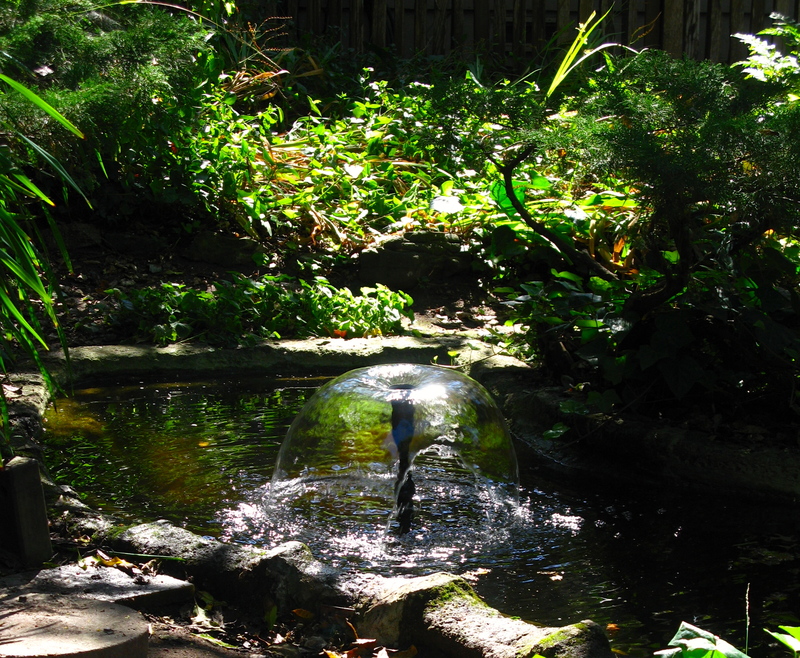 The quiet is broken by the sound of the fountain. 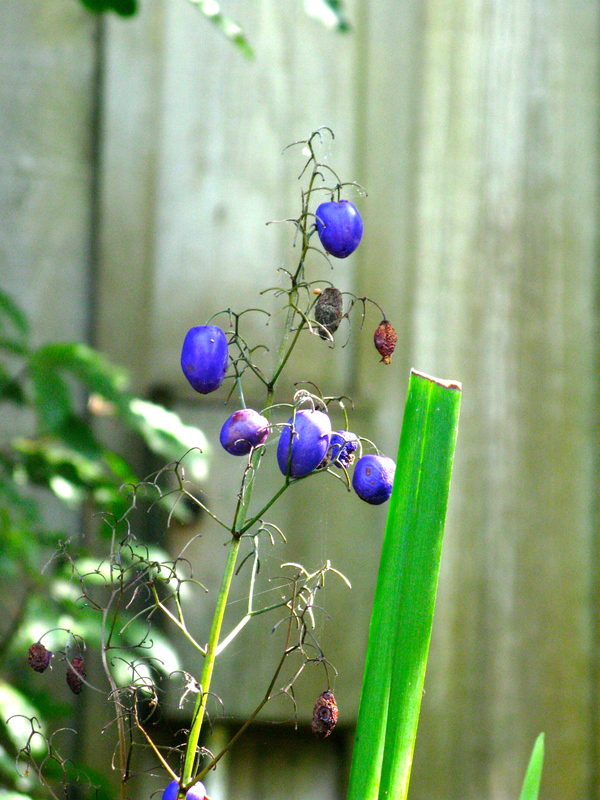 The last of the blue flax Lilly have bloomed leaving the seed pods behind. Dana, the current owner, inherited this property from her mother who planted hundreds of these lilies . 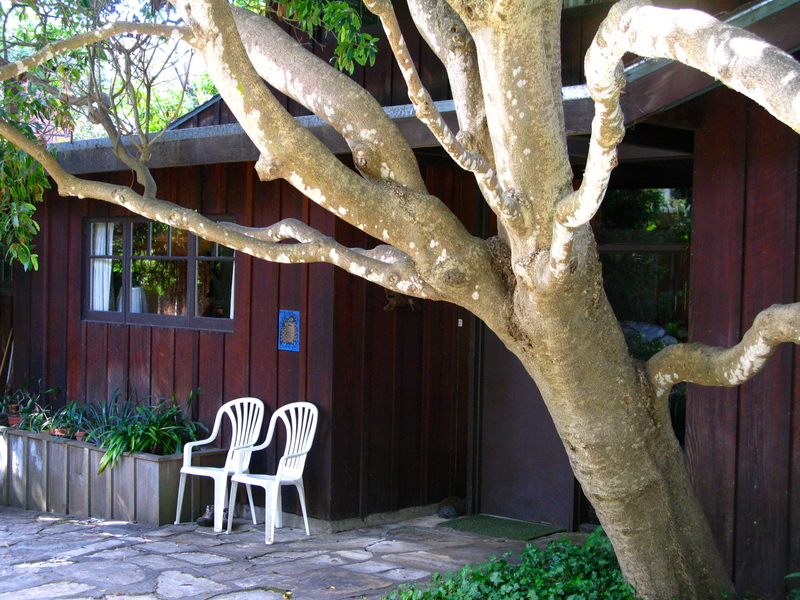 She leads us down the path of Carmel Stone to the north facing side of the cottage . 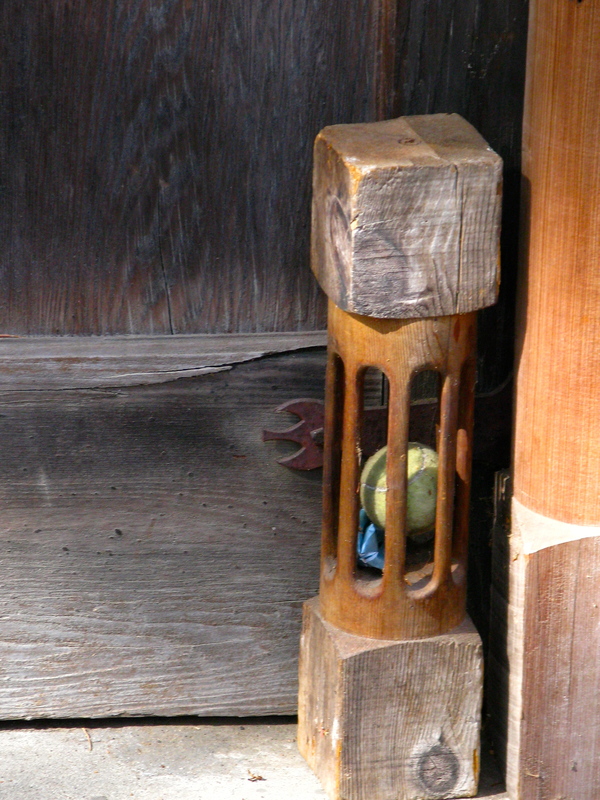 Once the entry, it is now closed off from the interior. But the door still remains covered by a charming shed roofed door hood. 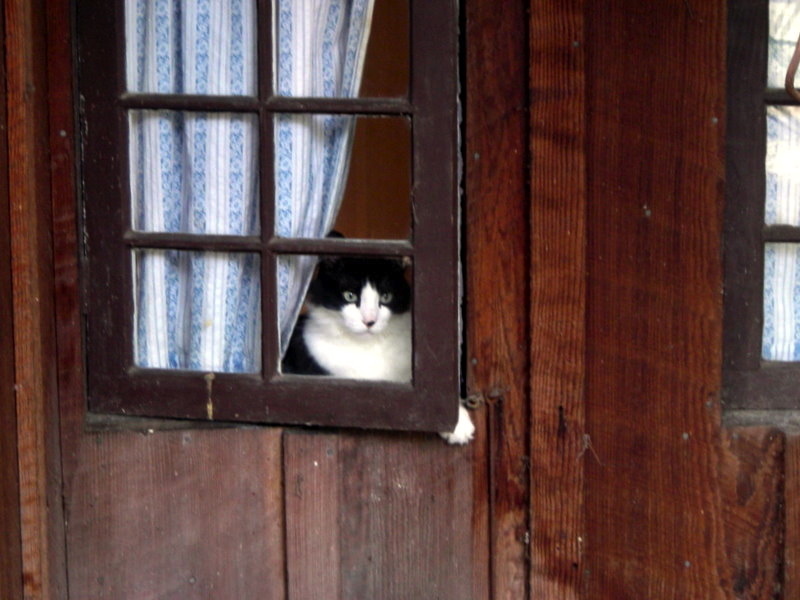 I admire the view of the window. The leaves in the photo are of the only dogwood tree in Carmel. It was planted by Dana’s mother. 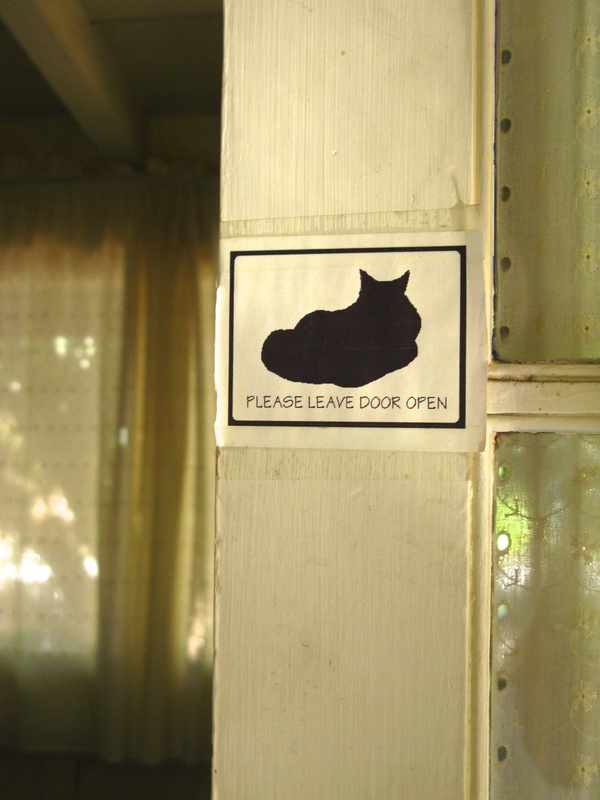 and enter the living room. At one end of this room a large window seat has been added. 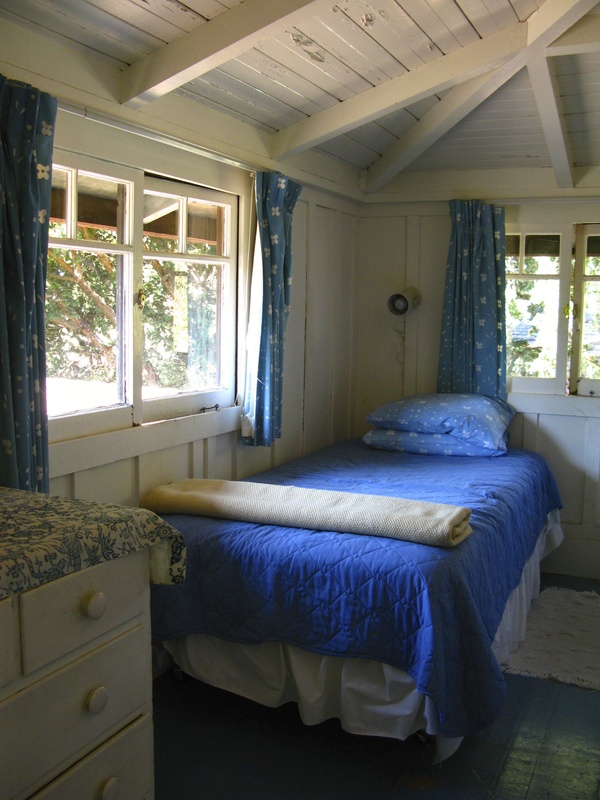 Then back through the cottage to the single bedroom. 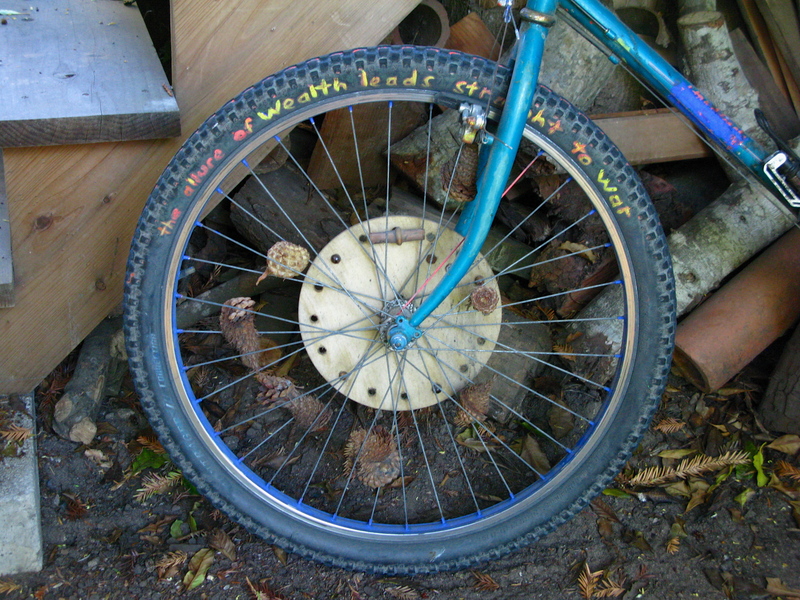 Note the lack of insulation. 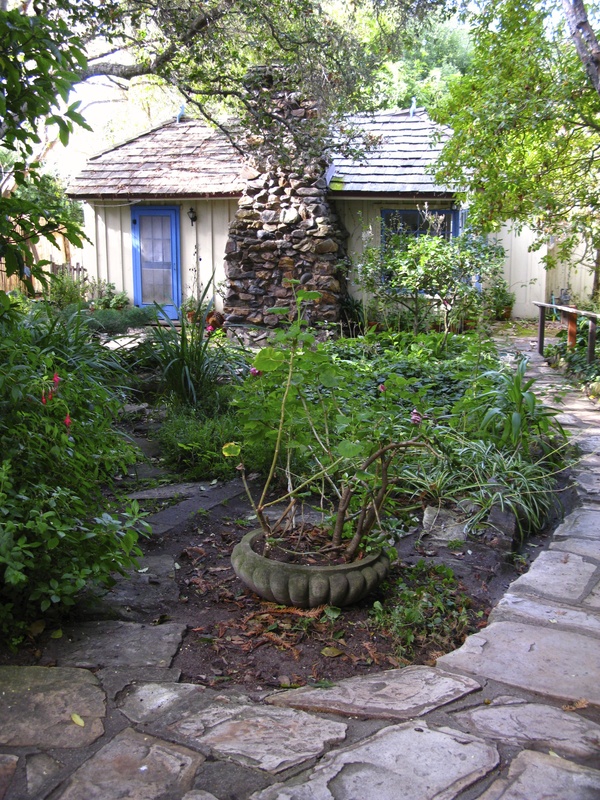 This is typical of older Carmel cottages. The parcel The Cottage sits on was purchased by Drs. Howard and Amelia Gates in 1910. 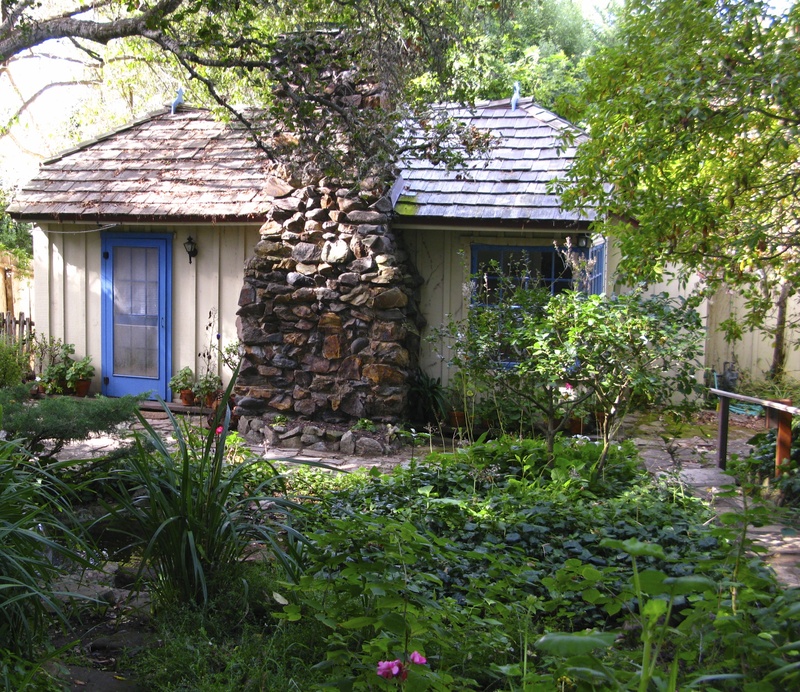 Graduates of John Hopkins University with active medical practices in San Jose and Los Angeles , they chose this as a vacation spot and built one or two small cabins. When Howard died in Rome in 1913, where he was chief surgeon of a large hospital, Amelia returned to San Francisco where she pioneered in preventive care for children and helped set up the Florence ward Hospital. 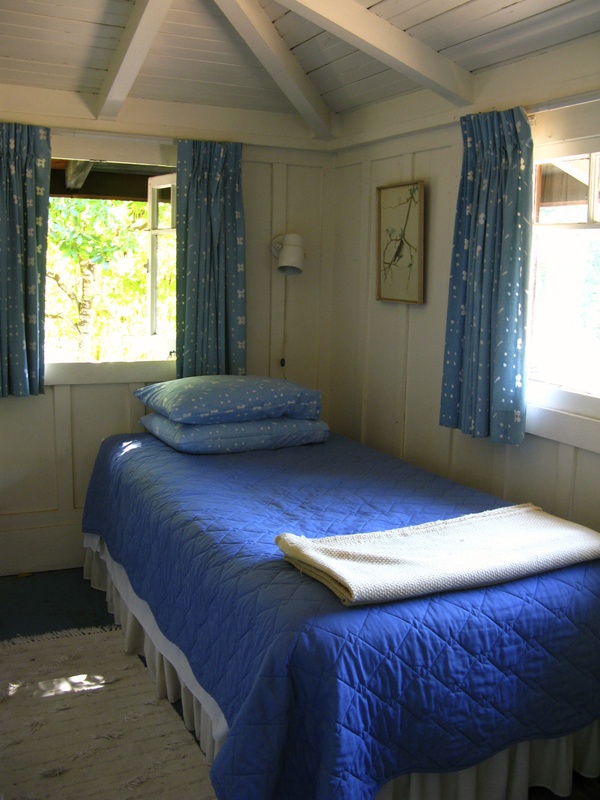 When she retired to Carmel in 1922, she replaced one of the cabins with this cottage of her own design modeled on Bavarian farmhouses with which she was familiar from her European travel. 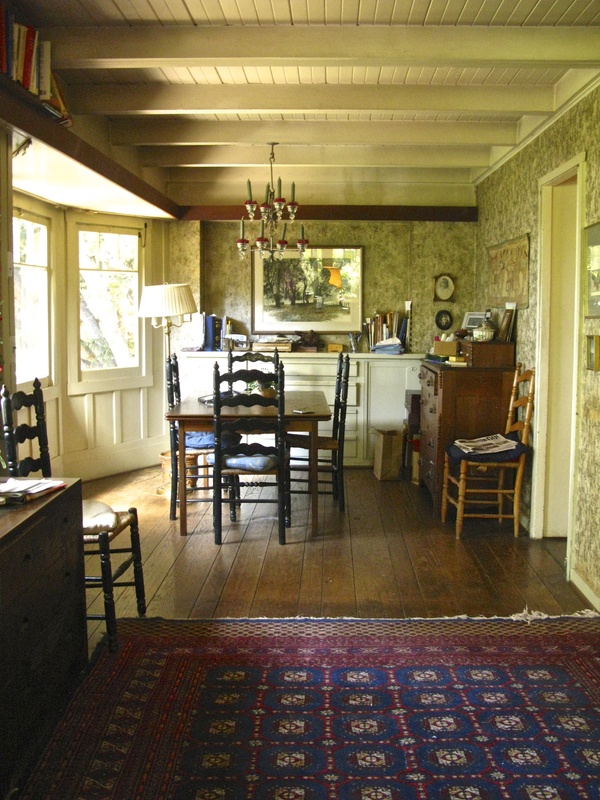 This little home became a meeting place for professional and creative people, including local suffragettes, labor leader, financiers and creative artists in many fields. 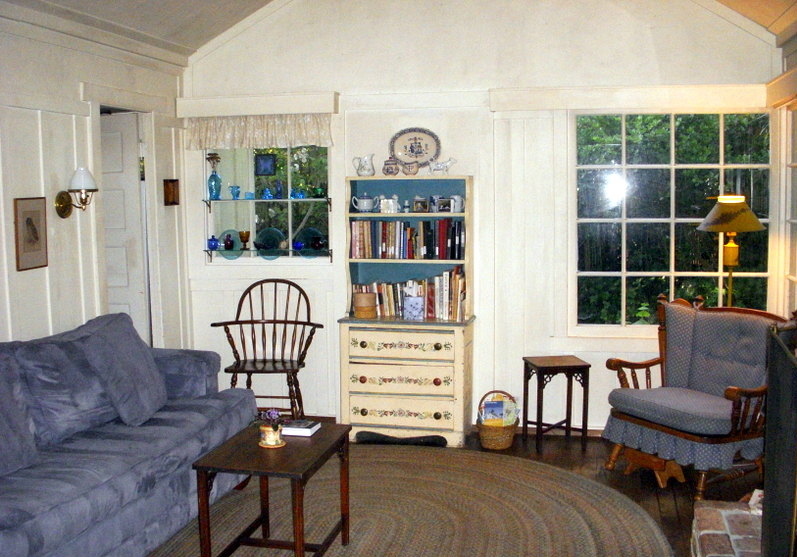 The Cottage now serves as the family guest cottage. Dana leads us up the walk and into a larger redwood home she inherited from her mother. 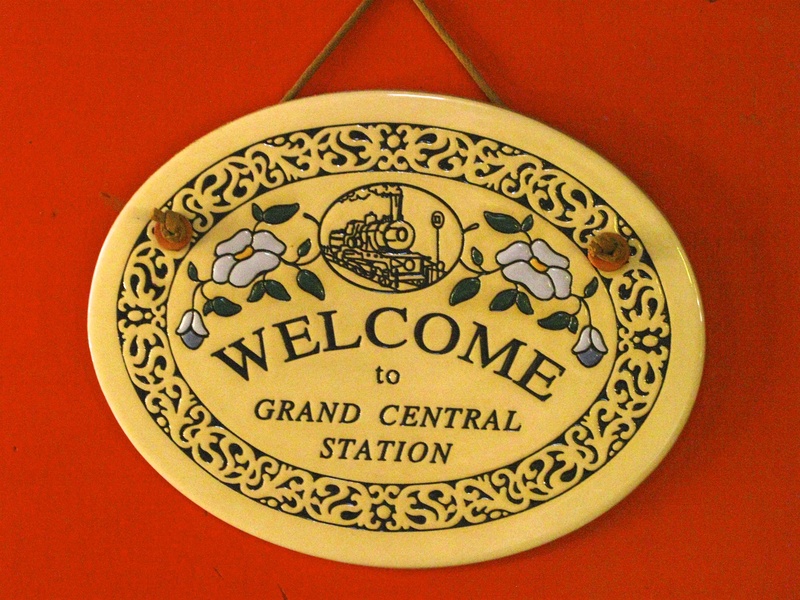 Her mother names the cottage Grand Central Station. 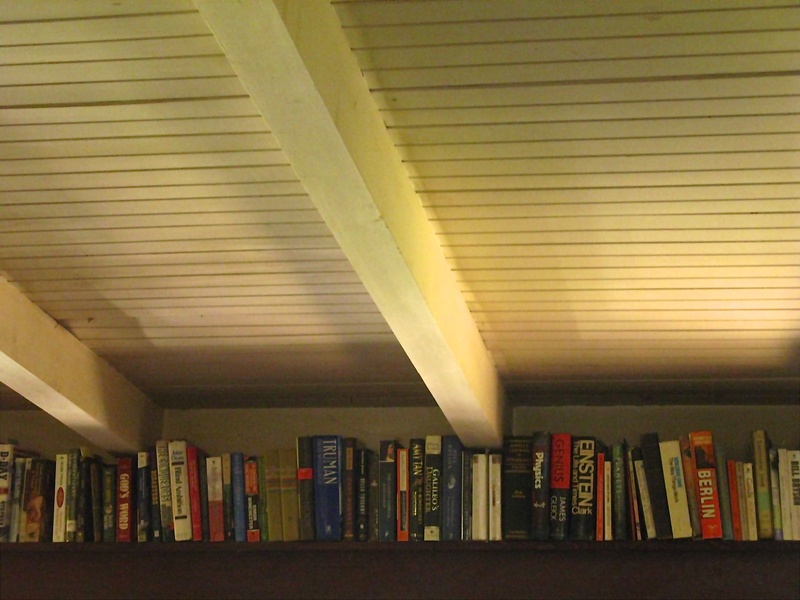 I find myself in a large cheerful space created from what was once three rooms. and comfortable chairs are everywhere. Dana’s husband fixes himself lunch while we talk. Children and grandchildren wander in and out. It is clear they love their grandparents and the love is returned. 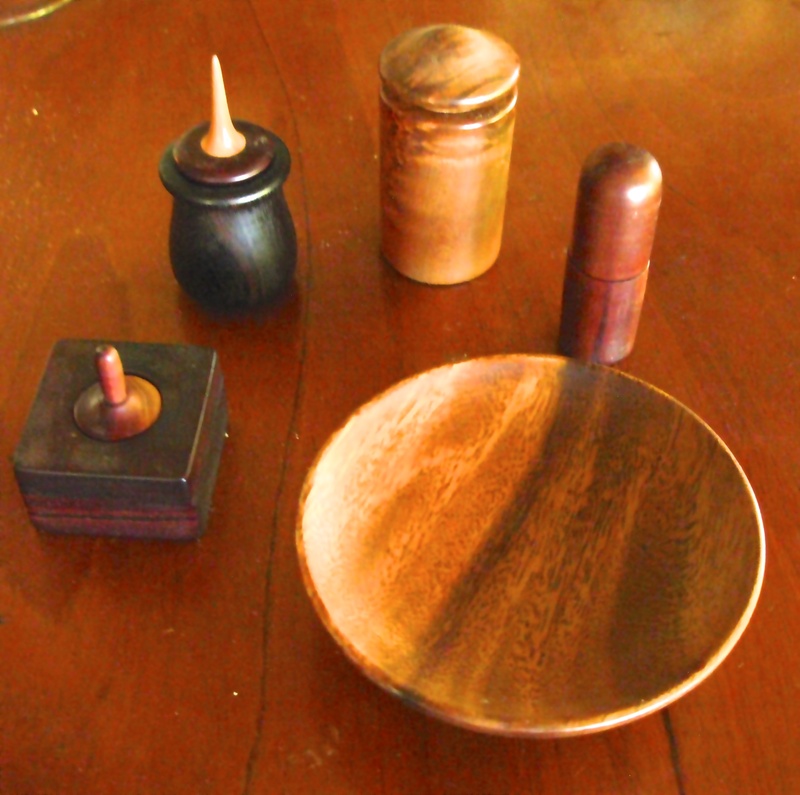 When I remark on some delicate wooden objects, I find they are made by her son in the carriage house at the front of the property. They are made by the process of turning the wood while a stationary tool is used to cut and shape it. 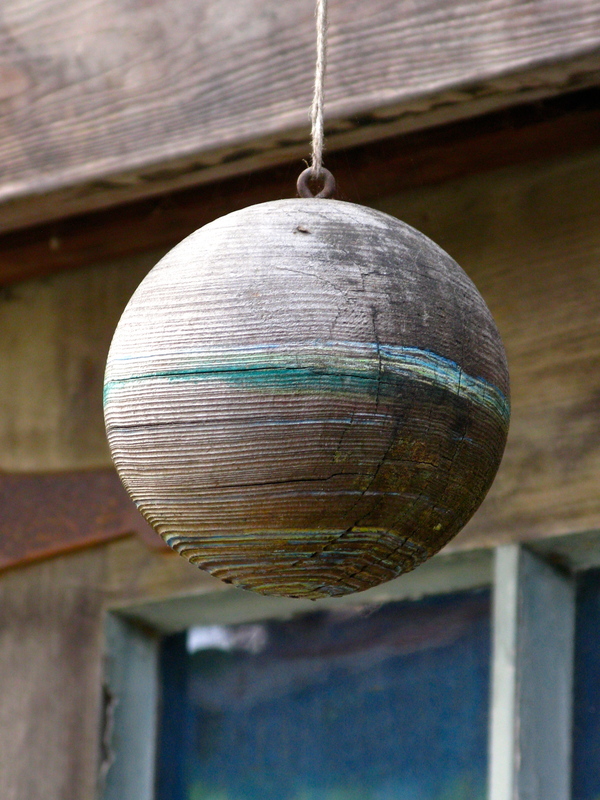 These wood turnings are quite delicate and beautiful. Dana (recently retired from 20 years as a docent at the Monterey Bay Aquarium) is also artistic – knitting, crochet, journaling needlepoint and drawing. 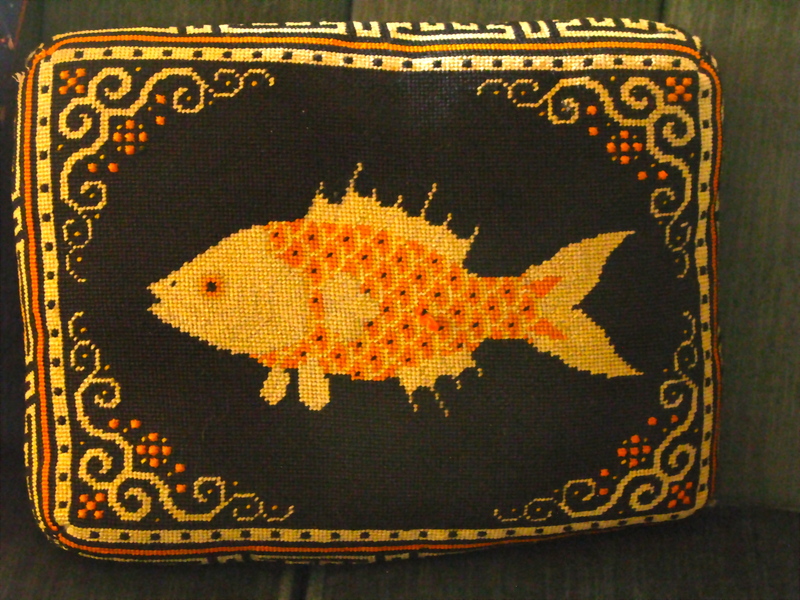 I admire this pillow she made. There are many footstools around the room. Dana and I are both “vertically challenged” and are forever trying to get our feet to meet the floor. She keeps two books under one chair. She sits and demonstrates that they are the perfect height. 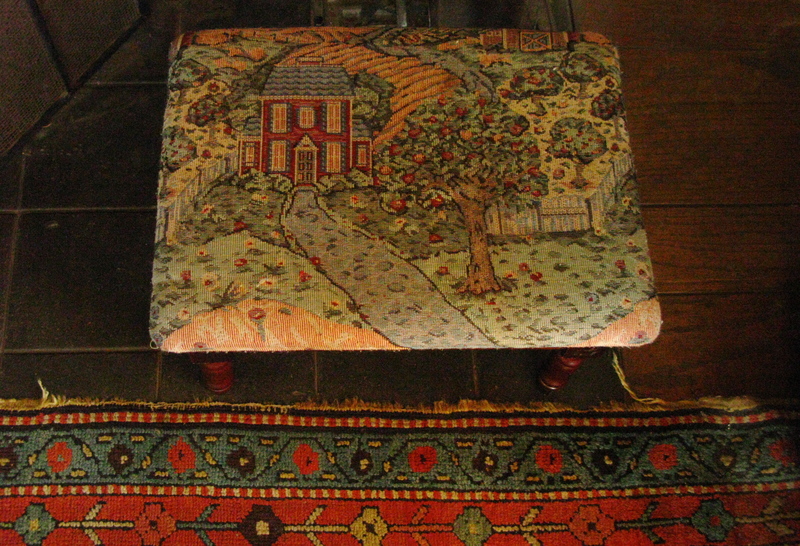 I covet this footstool given to her by one of her friends. It opens and stows away her knitting very nicely. We climb the stairs to see the bedroom. 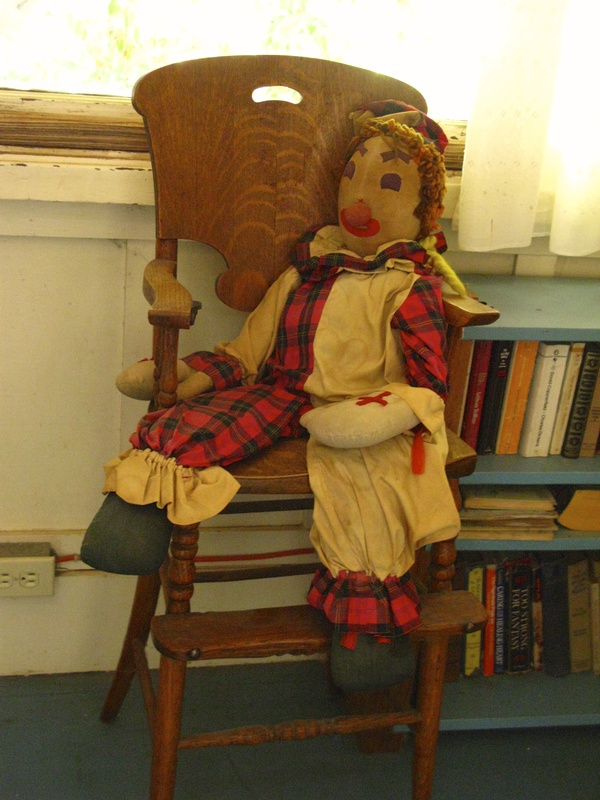 Her mother bought this rag doll to support the World War II war effort in Carmel. I am then introduced to the former Cat Of The House named Killer and read this short book written by Dana about his adventures. It is the first book the grandchildren asked to be read when they come to visit. 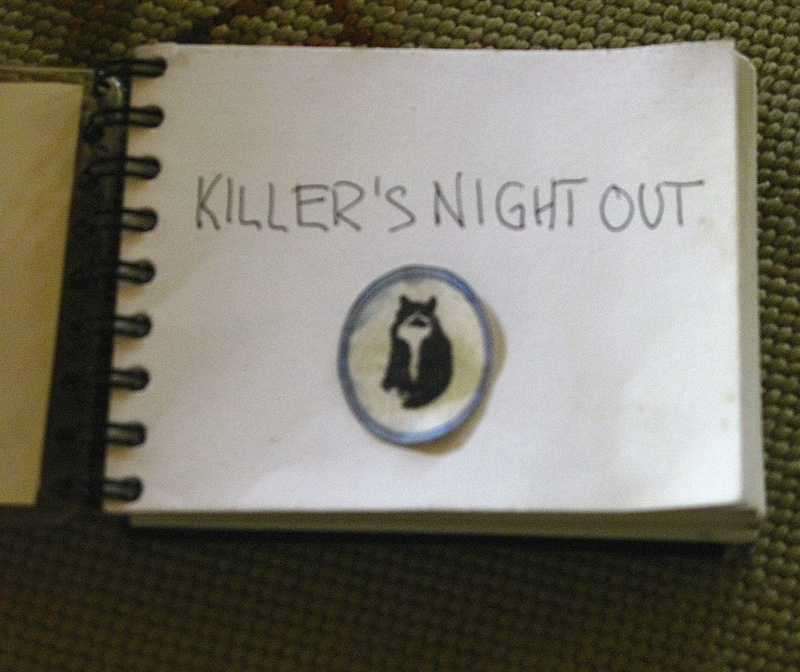 It seems Killer was delighted to sneak out one night and enjoy marvelous adventures. He hid when he was called. However, he met one of Carmel’s notorious raccoons and after noting its sharp teeth, allowed himself to captured and led back in. Dana shares this great shot she took of Killer. 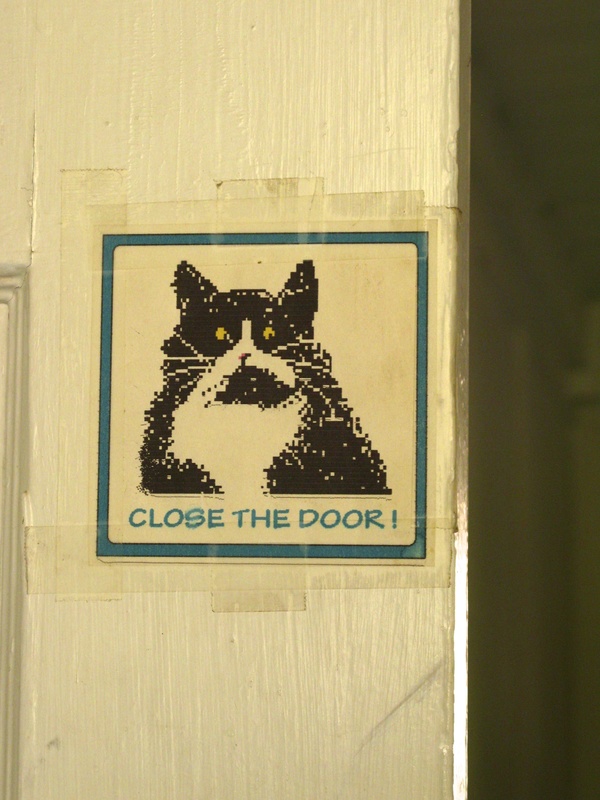 The current house cat is Henry and he disappears the moment I walk through the door. Our visit is over and Dana walks us up the path where I meet her son ,the woodturner. He rides up on his bicycle which I ask to photograph. 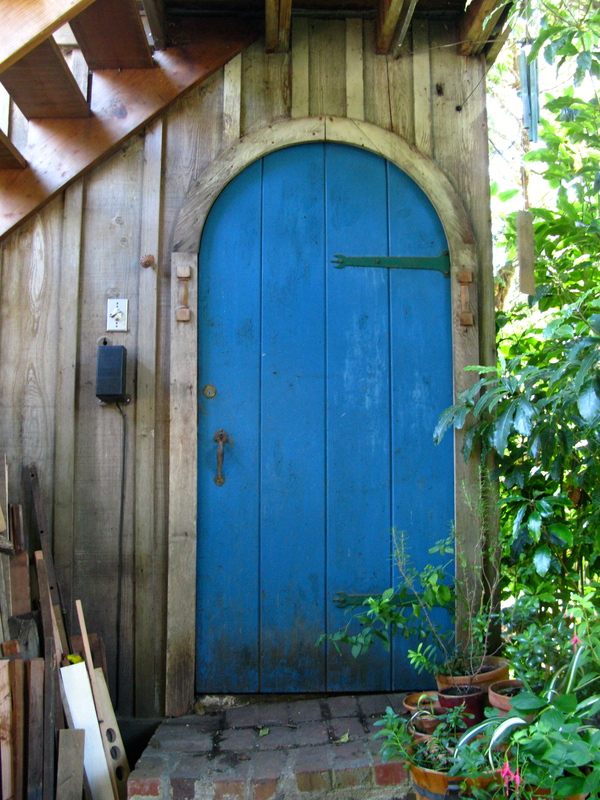 He and a friend enter the carriage house through this door. I take some shots of the studio on my way out. When I walked by several days ago, guitar music was wafting out the window. I suspect that Dr. Amelia would approve of the creative, intelligent, politically active family now living on the property and stewarding her Cottage. 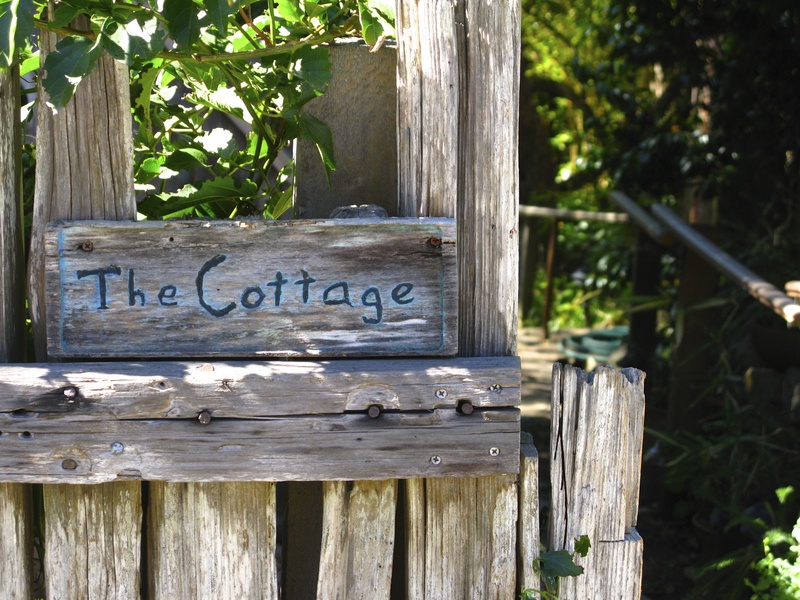 Nice that these cottages can stay in the family and continue the happy, literate, creative, and compassionate vibe established by the original owner. 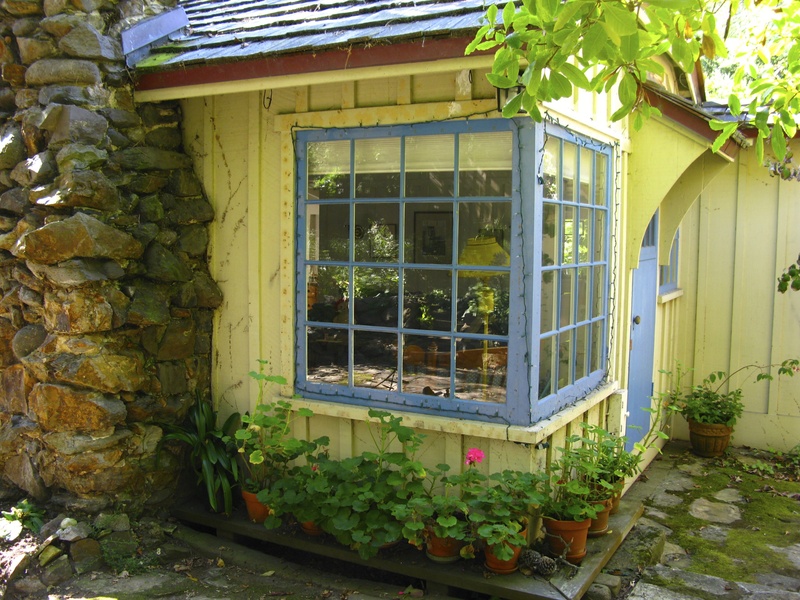 They are charming and welcoming in the way that only a cozy cottage filled with books, handcrafts, and family mementos can be. Thanks for the tour. It is a marvelous tour. 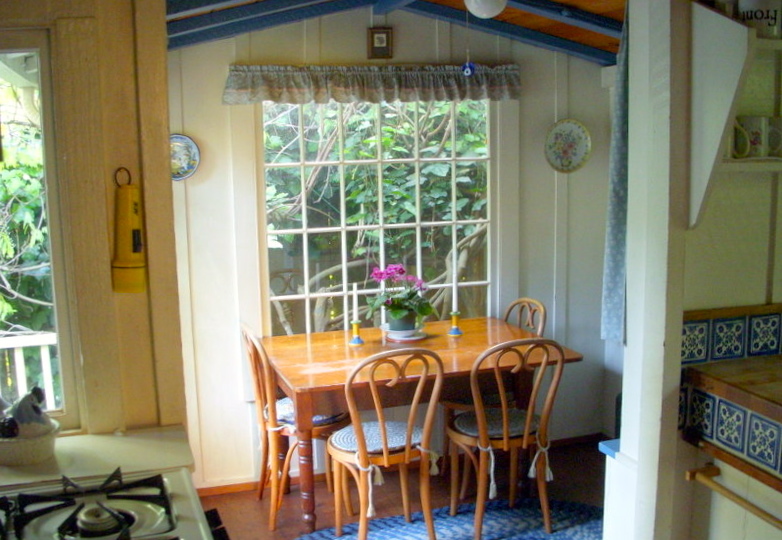 I notice the high chair that the doll is sitting on and love the ladder back chairs, the foot stool and pillow, and of course the cottage itself. Two beautiful cottages ! They have such personality and they are so inviting ! 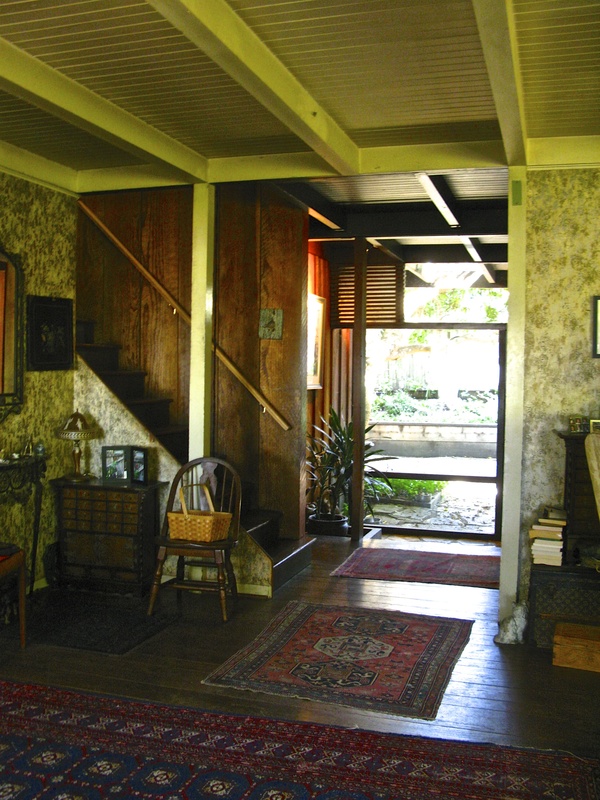 Did Amelia Gates build all three buildings, the main house, guest cottage and carriage house? Can you steer me to more information about her?